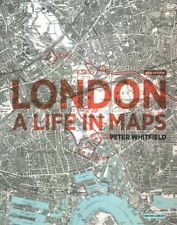 London: A Life in Maps began as a volume accompanying an exhibition at the British Library in 2006. (The exhibit lives on in virtual form at the Library’s web site.) The book was first published that year, and when it kept selling for more than a decade, revised for a new edition published in 2017. The exhibition was apparently divided into eight thematic areas, but Whitfield divides London’s history, unlike Gaul, into four parts: before the Great Fire of 1666, an “age of elegance” after the Fire (something of a long 18th century), a 19th-century metropolis in the Regency and Victorian periods, and suffering from “the shock of the new” in the 20th and 21st centuries. Twelve years on, the book is a reasonable substitute for a visit, and likely provides more background than the signage offered at the time. Whitfield’s volume is printed in a large format, full color on every page, and if there is a two-page spread without an illustration, I didn’t notice it. From the four chronological parts, Whitfield further divides his text into individual topics — Renaissance London Revealed, Copperplate: From Picture to Map, Shakespeare’s London, to choose four from the pre-Fire section — that are each just a few pages long. The approach adds up to a book that reads quickly, offers fascinating detail on selected items, and allows various themes to emerge over the course of the work. One of the most prominent theme is how minimally London has been governed over time. Since at least the late medieval period, when Whitfield’s account starts, there have been competing sources of power, wealth and authority along the Thames. In the beginning, royal power, Church authority and the financial muscle of the the City supported and competed with one another. The English Reformation, and particularly Henry VIII’s dissolution of the monasteries and other Church institutions broke ecclesiastical authority and tipped the balance very much in favor of the Crown. Royal ambitions required money, and that gave more leeway to the City. At the same time, the king gave former Church estates over to members of the aristocracy, greatly enhancing their power and laying the groundwork for much of London’t future development. Even as centuries passed, London never developed a central governing authority. The City proper guarded its prerogatives. Surrounding areas fell under one form of government or another, and these seldom worked in concert. Even in the 19th century, the railroads and the Tube were private initiatives, barely coordinated at best, destructively competitive at worst. On the narrow subject of maps and London, Whitfield traces how art, law, commerce and technology have all shaped how the city is depicted, and how that has changed over time. The first printed views of the city are exactly that: panoramas showing how London appeared from a particular vantage at a distance. These were followed by artifacts such as the Agas Map of 1633 that are half map and half view. Whitfield supplements the maps and panoramas with period illustrations. I was very interested to see, for example, pre-Fire buildings that survived into the early 19th century or the Gothic St. Paul’s. Another persistent theme is London’s constant expansion from the time that construction was first allowed outside the City walls to the enforcement of the Green Belt in the 1930s that seems finally to have placed a limit on suburban sprawl. Enterprising builders filled in the space between the City and the royal precincts at Westminster. “The decisive moment in London’s westward growth came between 1630 and 1640, with the extensive building that took place on the fields north of the Strand. The development of Lincoln’s Inn Fields and Covent Garden, with Drury Lane running between them, created the large, new, elegant residential district that is captured on the 1658 engraving by Hollar … Linconln’s Inn was the larger site, but there was a demand for some of it to be left as open fields, and houses were built only on the northern and western sides. Covent Garden, however, was planned by Inigo Jones as a unity, and on more innovative lines. It was modelled on the open piazzas which Jones had seen in Italy, open to the south, with a church on the west, and rows of fine houses around the square. … The experiment was an architectural and social success: wealthy buyers quickly took every available house, and by 1655 additional streets had filled almost the entire area between the Strand and Holborn, leaving only St Giles Fields open for a further twenty years.” (p. 53) In the decades and centuries that follow, the pattern repeats. Aristocratic landowners open their holdings to construction, hoping to attract wealthy builders and homeowners, and make a new fortune in the process. More often than not, they succeed, as London irresistibly draws people to its businesses and industries, first from around England, and then from all over the world. Whitfield makes a few interesting excursions, for instance into unrealized plans for various parts of London, or for the city as a whole. He shows maps of Wren’s plans for remaking London after the Fire, which would have opened up grand boulevards as Haussmann did much later in Paris. He also shows a plan for a vast royal palace in the center of Hyde Park, or a painting of a proposed pair of Thames bridges opening onto large piazzas on either bank. The stories of what might have been offer interesting counterpoints to how the city actually developed, and help to show how many choices that are literally set in stone now were once contingent and contested. I occasionally wished for more comparative perspectives, a line here or there mentioning how Paris or Constantinople or Rome or Berlin was addressing similar issues. Unfortunately, on one conspicuous occasion when Whitfield did offer a comparison, he botched it so badly that it may be just as well that he did not widen his focus more often. (On page 145, he mentions other European cities “adopting the Hauptbahnhof [central train station] idea.” None of the capitals of Europe’s great powers adopted this idea. Paris, Vienna, Berlin, Rome, St Petersburg all feature multiple stations. Moscow, though only Russia’s “second capital” at the time, has one square that is home to the Kazan, Leningrad and Yaroslavl stations, all major edifices on par with King’s Cross or Paddington.) Whitfield is also sniffy about modernity in general. He either doesn’t realize or chooses to overlook that the builders in the 18th century “age of elegance” that he writes about admiringly were just as grasping as the movers and shakers behind today’s skyscrapers, that the aristocrats subdividing their holdings reached for the latest technologies just as surely as contemporary property developers. Whitfield is much better at chronicling the years before 1900, so I am glad that he chose to devote only a sixth of his pages to the modern era. He played to his strengths. Five-sixths of the book are superb, and even the last section has interesting features. The choices of maps, sketches, and illustration are consistently intriguing. Whitfield balances aspects that are reasonably well known with close examinations of less-explored corners. For every “Dickens’ London” there is a look at London’s vanished rivers or an unfashionable suburb in the East End where arriving ocean liners dwarfed the nearby houses. Even though I’ve read London: A Life in Maps straight through, I will surely return to look again, to wander down lost streets or consider vistas that never were.